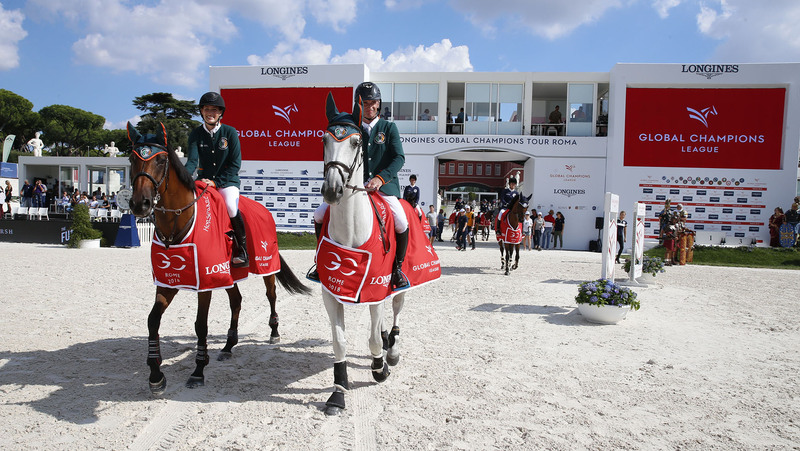 An edge-of-the-seat GCL cliffhanger saw series leaders London Knights clinging on to pole position in the overall championship with Miami Celtics propelled into third place after a spectacular victory in Rome. The electrifying competition came down to the wire as the front-runners Prague Lions suffered a major setback when Swedish champion Peder Fredricson’s star horse Hansson WL dramatically refused a fence pushing them back into third place. St Tropez Pirates’ duo Edwina Tops-Alexander and Athina Onassis kept it consistent and made it into second place on the podium. London Knights are now 23 points ahead of their season long rivals Valkenswaard United - their lead was once a dominating 38 points - but now they face an epic battle to stay on top at the finals in Doha. There was drama up and down the field, with Rome Gladiators losing a place to sit now 4th in the overall ranking, just one point away from the Shanghai Swans who are achingly close to achieving their top four goal. Furthermore, the Montreal Diamonds, Scandinavian Vikings and St Tropez Pirates now all sit within 7 points of each other, and are within touching distance of the top four should they secure a strong result in Doha. Uliano Vezzani’s course featured many beautifully crafted fences with cultural references such as the Colosseum, gladiators and a new beast - a Romulus and Remus designed wall, with the distinctive outline of a wolf causing many horses to double-take. Plenty of riders entered the ring and rode straight over to the wall to let their horse have a look before the bell rang, giving themselves the best chance before tackling the challenging obstacle. The course was delicate, with many big verticals that fell at the lightest of touches. As with many of Vezzani’s meticulously designed courses, faults fell all over the field, with fans kept on the edge of their seats with every challenge. Fans packed the arena, delighted by a gladiatorial reveal for the home city team, with Constant Van Paesschen, Lorenzo de Luca and Marlon Zanotelli escorted in by actors ahead of the coursewalk. It would be a case of standing room only, as spectators watched every round, treated to an exceptional afternoon of top sport. Montreal Diamonds started their campaign on the back foot, but bolstered their chances taking points after they sent in anchor and World Number 1 Harrie Smolders with top stallion Emerald. The pair delivered, jumping brilliantly to a roar of approval from the crowd. U25 rider Jos Verlooy brought out Caracas, but another four faults would add to their heavy score of yesterday. Valkenswaard United had everything to do today, with the team making a strategic change of Bertram Allen for Jur Vrieling Zypern III, the Dutch rider deliveing with a clear as Alberto Zorzi collected another four faults with Contanga 3. Their score of 13 meant they would not make a podium today, but with plenty of big scores they quickly rose up the overall ranking. Speaking after his round, Jur said: “It’s difficult, it’s high and technical - you have to know every distance. Double clears are hard to come by!" The Romulus and Remes wolf wall took a few victims, including Paris Panthers’ Nayel Nassar and Lucifer who ducked out at the last minute. However teammate Yuri Mansur pulled a clear out of the bag for the team with Inferno to try collect as many points as possible for the Paris, who are keen to keep clear of the GC Playoffs drop zone. Christian Ahlmann of the Scandinavian Vikings was also caught out by the wall, with Tokyo crashing through to put the team on a score of 13 overall after last year’s LGCT Grand Prix of Rome winner Evelina Tovek collect four faults. There was high drama after Monaco Aces’ Simon Delestre and Chesall Zimquest were eliminated, the chestnut gelding running out twice at the wolf-shaped wall not liking the look of the fence one bit. The team plummeted to the bottom of the order, the Aces taking home zero points today in Rome. Home city team Rome Gladiators also had a disappointing afternoon, after Constant Van Paesschen collected eight faults with Jilbert van'T Ruytershof, and local hero Lorenzo de Luca picked up another four with top stallion Halifax van het Kluizebos. Athina Onassis of St Tropez Pirates brought out a beautiful clear with MHS Going Global, picking up just one time fault to add to the team’s score of 1 from yesterday. Teammate Edwina Tops-Alexander looked focused with California, the pair powering around the arena. And they brought home another clear, the Pirates home and dry on just two faults in total, and with just two teams left to go. Miami Celtics knew they had a chance to win today, and potentially put the team in the top four of the Championship - meaning they would fast-track to the GC Playoffs semi-finals. First of the team to go, Jessica Springsteen, set off at a pace with RMF Zecilie - the duo flying around the course to keep the team in the best possible position. Denis Lynch made a strategic change to ride RMF Echo, their tactics paying off as they secured the first double clear of the day and shot to the top of the leaderboard. All eyes turned to the Prague Lions, with U25 talent Anna Kellnerova first into the arena aboard Silverstone G. As her teammates watched on, the young star kept her cool under pressure, riding the big horse carefully but with a forward pace, taking on the fences in style. As they cleared the last Anna punched her fist in the air, delighted she had kept the team in with a chance of the win. But it was the big bad wolf who would be the Lions’ downfall, as Peder Fredricson and Hansson WL’s round came undone as the imposing Romulus and Remus wall. A late refusal from the normally consistent horse and a time fault to boot meant the team would drop to third, leaving the Celtics to take the win, with the Pirates in second and the Lions third today. Anna Kellnerova, Prague Lions, 3rd place: “Peder really supported me the first day, and was really unlucky today - but that’s the sport and he did really great to come back around and finish, which meant we would stay on the podium. You have to have a lot of nerve and experience to do that, so I’m very lucky to call him my partner in the Prague Lions. I can enjoy the show [this year] as I have a season behind me - I can come to every venue knowing what to expect and enjoy the ride while also working as hard as I can. We’re extremely excited for the Prague Playoffs and there’s a huge support team all round us. Everyone’s talking about it, and for Prague and the Czech Republic it will be absolutely incredible and we’re very happy to be working with the Global Champions Tour and be a part of this!" Jessica Springsteen, Miami Celtics, 1st place: “My horse jumped beautifully, she’s been so good and so consistent so I’m really lucky to have her. She jumped two beautiful rounds, and I’m really happy with where we ended up today!" Denis Lynch, Miami Celtics, 1st place: “The focus is on. The rounds are not for the day, but for the overall [Championship] and for Doha, and looking ahead to the Playoffs. The plan was always to change horses. We came to do a job, keep the focus, and do the best we could do.